I grew up collecting everything: stickers, stamps, lip gloss, pens, pencils, highlighters, erasers, etc. I loved to shop, but as I accumulated possessions without discarding much, my stuff eventually became more of a burden. This became especially clear after college, once I started working. I viewed shopping as "retail therapy" and didn't quite know how to stop. 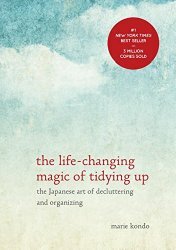 Feeling overwhelmed, I started reading minimalism blogs, curious about how other people related to their possessions. 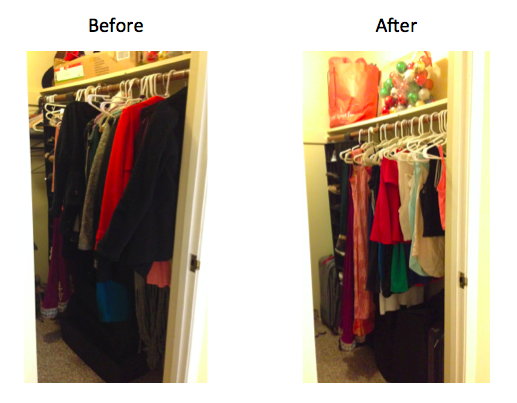 I discovered Marie Kondo's best-seller, The Life-Changing Magic of Tidying Up, and followed its instructions. What followed was something deeper; I began tidying my life. I quit my job (since it did not #sparkjoy), planned the Tokyo vacation I'd been dreaming of for years, and became Kondo's first US-based employee (more about that in this NYT Magazine article). Through my decluttering service, I ultimately want to share my expertise with others and help them transform their lives through tidying, the way it has for me. This is my true calling (staying in to organize on Friday nights was an obvious sign, many friends have noted). I'm excited to guide people through the process of re-evaluating their lives, beginning with their possessions, and I strongly believe in the potential for some "life-changing magic." I studied finance and psychology at the University of Pennsylvania, which have helped shape my analytical and empathetic, client-focused approach to tidying. I spend less time organizing my home now, since it's so easy to take care of. This has saved me so much time and energy. I'm more productive, and my mind is much more relaxed. This has been the most impactful change, for me, in the last 20 years of my life. This process has changed my thoughts and emotions, not just my closet. You brought joy and happiness back into my life! Jenny has an objective point of view and positive energy. I felt like she really wanted to help, and she had such a kind, unjudging, and considerate nature. Decluttering with her was amazing, and I really felt like it helped me re-evaluate my life in so many ways. I'd recommend Jenny to everyone! Jenny had a solution-oriented mindset and an eye for what would make me the most happy, not some formula. She was non-judgmental, showed a lot of compassion for me, and highly enthusiastic about her work. I am so grateful for her help! Now, my closet and drawers feel like they are showcasing my favorite store's merchandise! Clearing all the closets and seeing exactly how much stuff I had in them was so helpful, I never do that. Also, learning about how to judge whether to let go of gifts after receiving them was valuable, since before I'd always felt the need to keep them forever. I'm already noticing a change in how I treat my clothes. I put them away immediately now instead of throwing them on the floor and couch. 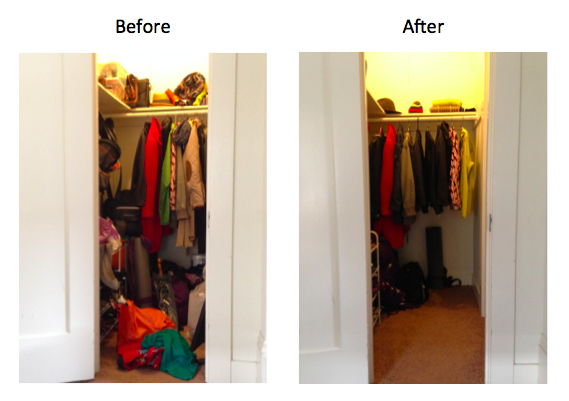 My house is generally pretty organized, but I avoided a hall closet because it was too overwhelming. Jenny was both patient and efficient, helping me get through all the stuff that had accumulated over the years. In the end, there was so much empty space that I had room to display some of my favorite things. Now when I walk by the closet, I often stop to admire it! After organizing my books, I understand myself more. Seeing my books categorized by type helped me realize that my life is pretty well-balanced - and interesting, if I do say so myself! In the past, I also avoided my bookshelf because it seemed hopelessly messy. I feel more confident now, and even the air in the room feels more fresh.